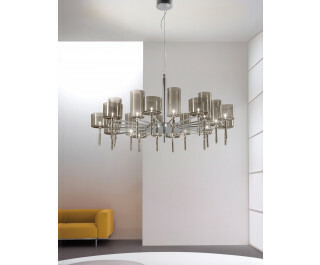 Spillray is a collection of pendant lamps, ceiling lights, wall lights and table lamps. It is eclectic and elegant but also witty; the different possible compositions create fluid and sophisticated lighting effects. The diffusers are in glass and come in three different sizes and in the following versions: single, in series with 6 and 10 lights, and a circular arrangement of 3 and 12 lights. Spillray collection comes in crystal, orange, red or grey with chrome metal frame and it also has a wall lamp. Individually or grouped, the lamps in the Spillray collection fit easily into both home and contract environments, enhancing and personalizing any type of surroundings. 12 V halogen light source.